As many of you know (and as all of you will soon know), I’m a huge Justin Timberlake fan. This may surprise some of you, because I tend to lean away from pop music as my music of choice, but you see, JT planted himself in my life when I was 13 and he has firmly stayed in my heart ever since. 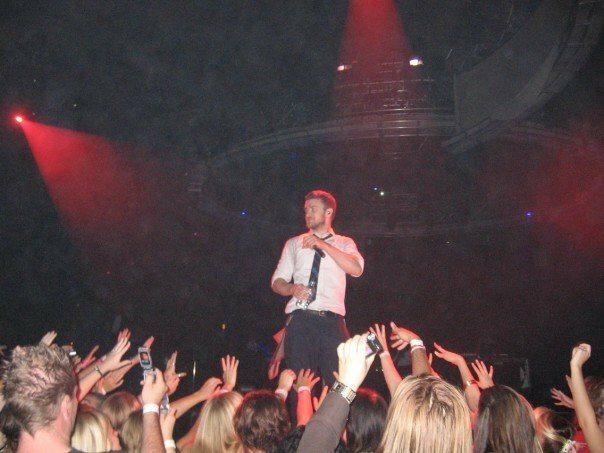 Yep, I was one of those crazy ‘NSYNC fangirls. ‘NSYNC basically consumed my junior high experience (along with my best friend Laura who was just as crazy as I). We even saw them in concert twice – once in Edmonton, and once in Toronto. Yes, you read that right, my parents made it possible for me, Laura and my sister to fly to Toronto with my Mom to see ‘NSYNC at the SkyDome. Aside from the migraine I developed due to my overwhelming excitement, it was possibly one of the most fun experiences of my life. Well, that was until Sheila and I scored tickets to be second row when Justin Timberlake rolled into Edmonton 6 years ago (SIX YEARS). That was great. We were standing behind some guys who, very graciously, let us stand in front of them for a few songs so that we could be right at the stage. Like, touching the stage. At the end of the show, JT sprayed his water bottle over the crowd, soaking us. When I tell that part of the story, most (read: all) people respond in the same way: “Eeeew! That’s gross.” No way. Not gross. It’s Justin Timberlake! Wait. What? Justin Timberlake is releasing a new song today? And now an entire album has been confirmed to come out later this year? He hasn’t released music in 7 years. It’s Christmas all over again! Well, folks, he did it. His single Suit & Tie was just released and so far I’ve played it 5 times. Go here: http://countdown.justintimberlake.com/ to listen, download on iTunes and then dance around your kitchen. Enter your email address to follow Parade of Stories and receive notifications of new posts by email.